Definition at line 72 of file pr2_arm_kinematics_plugin.h. Definition at line 87 of file pr2_arm_kinematics_plugin.cpp. Definition at line 88 of file pr2_arm_kinematics_plugin.h. Definition at line 101 of file pr2_arm_kinematics_plugin.cpp. Definition at line 157 of file pr2_arm_kinematics_plugin.cpp. Definition at line 51 of file pr2_arm_kinematics_plugin.cpp. Definition at line 104 of file pr2_arm_kinematics_plugin.h. Indicates whether the solver has been successfully initialized. Definition at line 98 of file pr2_arm_kinematics_plugin.h. Definition at line 114 of file pr2_arm_kinematics_plugin.h. 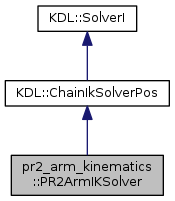 The PR2 inverse kinematics solver. Definition at line 116 of file pr2_arm_kinematics_plugin.h. Definition at line 112 of file pr2_arm_kinematics_plugin.h.